Once again I insult before I actually know where I stand. Thankfully I could hide behind the internet this time. On MSN, chatting with two friends: Friend: So Guys, I took a political test online today. Guess which party I was like? Green party? Yeah! I checked and they were the ones who were nearest my results. Ohh tough break, you just found out you were gay through an online politics test. Tories? No Other Friend: Lib Dems? The BNP? No No Die in a fire. Take it, let's see what you get? One more click... *done*! 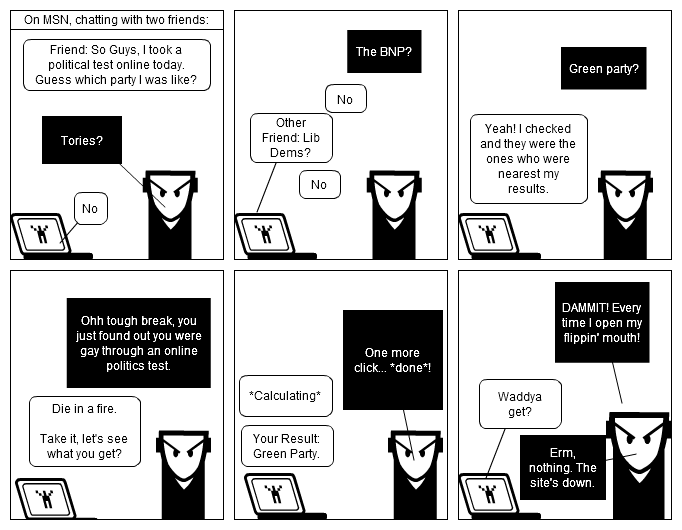 *Calculating* Your Result: Green Party. DAMMIT! Every time I open my flippin' mouth! Waddya get? Erm, nothing. The site's down.